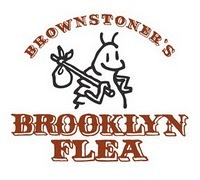 Brooklyn Flea, a new weekly flea market organized by the lovely folks who run the Brooklyn-based blog Brownstoner (say that fast five times), is opening this Sunday in Fort Greene. The market will occupy a 40,000-square-foot lot and will be the largest outdoor market in all of New York City. Isn't that exciting? Brooklyn Flea will take place every Sunday from 10am to 5pm—rain or shine—starting April 6, 2008, at Bishop Loughlin Memorial High School in Fort Greene, Brooklyn, on Lafayette Ave. between Clermont and Vanderbilt Ave. The Flea will feature 200 vendors of vintage furniture, clothing and antiques alongside new designs by local makers of everything from jewelry to textiles. Even though it'll be a total madhouse, I'm going. Hope to see you there! PS - Beverly got Brooklyn fleas before (three times, actually) and it wasn't pretty.